"Why is everyone so ready to believe the worst is over?" If that isn’t a question that speaks to our current moment more than any other I’m not sure I could come up with a better – every morning I wake up and ask myself, “Is this the day the world ends?” So when that question slips from the lips of Suzy Bannion (Dakota Johnson) three-quarters of the way through Luca Guadagnino’s Suspiria, that’s when what Luca is up to here really snapped into place. 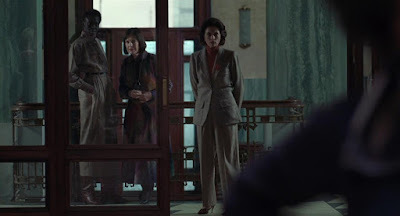 And make no mistake about it, what he is up to here is so far removed from what Dario Argento was up to with his 1977 version of Suspiria that it might too take you some effort to truly shake off your expectations and settle in to what’s happening here yourself. For all its odd flashes of masks and bedevilry this is a Luca Guadagnino Film, through and through. To use the word "remake" is near nigh impossible. Luca’s film has the bones of Argento’s – that is the plot is shaped around the same stuff. 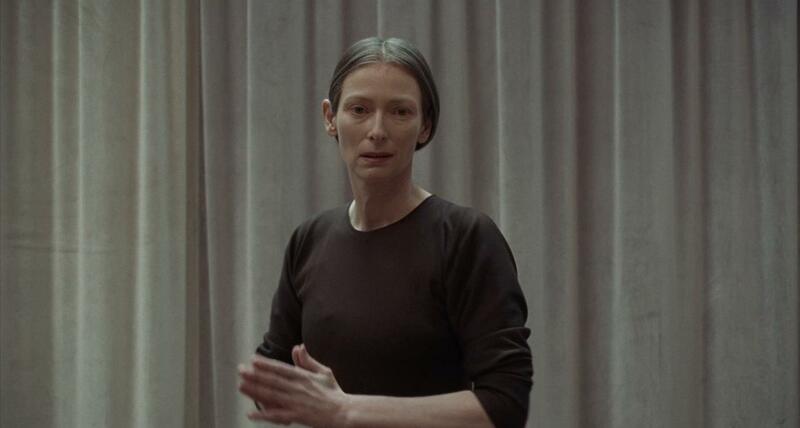 Suzy is an American Girl who travels to Berlin to dance at the school of Madame Blanc (Tilda Swinton) and the shadowy headmistress Helena Markos. She makes friends with a girl named Sara (a very good Mia Goth) and takes the room of the runaway student Patricia (Chloe Grace Moretz). And yet none of those things really feel like anything that they felt before. Everything underneath, guts and stuff, is eviscerated and reshaped – at one point in the film we see a witchy hand run across a wound to heal it and this movie is something like that; you don’t see the Frankenstein stiches, it’s far deeper, meatier, than that. From the feet up. Even further – as Madame Blanc says at one point, from the space beneath the feet. That’s what counts. 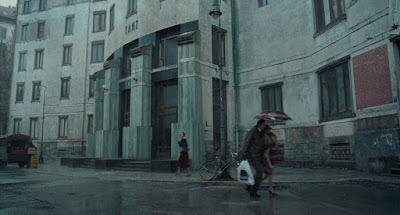 Where Argento gave us a technicolor fever dream wholly divorced from the real world Guadagnino takes great pains to insert his story into a very specific time and place - the year is 1977, the year I was born and the year the original film came out, as Berlin was a city terrorized by the Baader-Meinhof bombings. It's the German Autumn of Rainer Werner Fassbinder, this more than anybody - you can feel Fassbinder’s touch in the hard ugly fabrics, the sickly plastic shells of yellow telephones and smoker's teeth. That Germany was facing down the devils of its past, feeling and fearing that somewhere under the surface the rot had kept hold and seeped into the present - Fassbinder and his contemporaries were rummaging around in the fact that their parents’ generation was responsible for the unspeakable horrors of Nazism and the Holocaust of course, and they had a very real and recent reason to mistrust authority. What do you do if your parents quite literally dragged the entire world into hell itself? I don’t know about you but that sense of generational betrayal, that sense of something stinking from high up, it informs my day to day these days, watching my country, one of many, walking off another cliff. And every day the helplessness, the panic, the madness takes hold. Bad dreams, the ceiling is leaking, there are bees. We all snap at each other on the subway more. 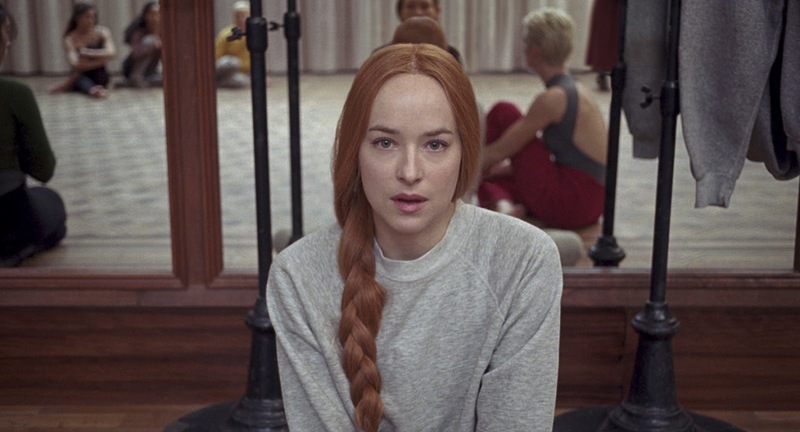 Luca’s Suspiria is here to feed off our bad dreams. To tell us that the worst is still happening, still coming, a force unreckonable in the basement, creeping up. There’s a scene of such broken-boned cruelty in this film I nearly crawled backwards over my seat – this is our fortune now; shaped by forces beyond our control, wrenched and snapped and squeezed and carted away like deer carcass, a stinky soil in our wake. Or is it? The film’s actually far weirder than that, and not in the same sense as Argento’s dreamy strangeness either – this is, in the words of Rosemary, no dream this is really happening. (And I think it's no mistake that the film I thought of more than any other was Ken Russell's The Devils, which tells you plenty about the fences Luca is swinging for here.) There is an intellectual and emotional rigor; it’s even at times kind, romantic. There are charts and maps and the star-figures of monstrous motherhood, the dry skin surface of concrete architecture, all bound up in a six-part psycho requiem for our souls. Nightmares abound but the flesh, the flesh is where they’re based. Where they’re scratched in. In this grand new world of complications amid complications there’s nothing so safe and sound as Suzy’s original hero’s journey into Hell and back again – the “they” of the “other” isn’t quite that plain. We’re all others now, unknown to ourselves and made of unfamiliar building materials – raised on the blood-red plains of no place and instilled with unspeakable artifacts of who knows what histories. It doesn’t matter how hard you try to tell everybody about yourself, not with the loud whistling of apocalypse in our ears.